Photobrook Photography: Biggest waves in the world in Cornwall, the view from Perranporth. Biggest waves in the world in Cornwall, the view from Perranporth. It's still hard to believe the hype but after today's damage seen around the coast it is definitely believable that today the waves were bigger in Cornwall than anywhere else in the world. With the giant swell forecast I had to head out to the coast to see what was happening. I headed to Perranporth this morning for high tide and was greeted by several other photographers, storm watchers and the police keeping everyone safe. Whilst more police and fire service worked to pump out the flood water at the Tywarnhayle pub everyone else was watching the encroaching tide. Here's a few pictures from Perranporth this morning but i'm pleased to say that there was no damage caused and the flooding wasn't anywhere near as bad as previous swells with the waves held back by the southerly wind. This southerly wind that saved the north coast from destruction sadly caused mayhem on the south coast. The north coast survived today's massive swell but with bigger waves forecast on Saturday and more wind and rain to follow who knows what will happen to Cornwall and quite honestly I don't think it can take any more! 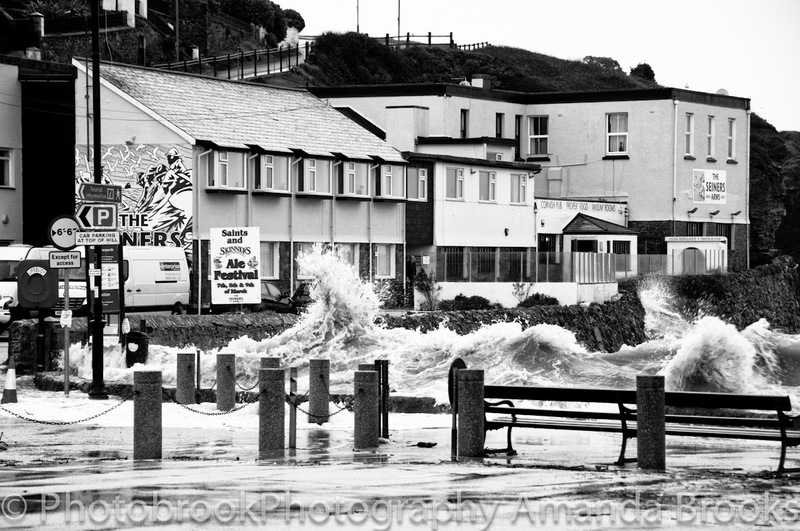 To see more photo's of Perranporth this morning during the storm swell and lots more photographs from around Cornwall visit Photobrook Photography on Facebook.